Everyone is coming back from vacation, kids are happy to see their friends and it’s still nice and sunny. No worries about exams yet. What better time could there possibly be! 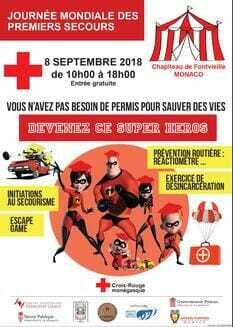 The Monegasque Red Cross wanted to celebrate the International First Aid Day by organizing, in collaboration with the Princely Government, the Princess Grace Hospital, the Road Safety Association, and private organizations, an open day on September 8th at the Chapiteau de Fontvieille from 10 am to 6 pm. A new exhibition of the “Creative Meridian Hub” created by Olivier Jude and Jean-Michel Mille, in collaboration with the Monaco Association for the Protection of Nature, invites you to discover the seabed of Monaco until September 15th. This exhibition of fifteen underwater photographs reveals the beauty of nature and raises public awareness of the urgency of preserving it. If you haven’t been there yet, visit the The Gold of the Pharaohs exhibition. For its major 2018 summer exhibition, Grimaldi Forum Monaco revives an Egyptian theme which it had already successfully tackled in 2008 with the exhibition “Queens of Egypt”. The Gold of the Pharaohs exhibition brings together more than 150 masterpieces from the Cairo Museum and presents a series of prestigious ensembles discovered in the royal and princely tombs of Pharaonic Egypt. Beyond presenting sumptuous ensembles (jewels, vases, bracelets, pendants, goldsmith belts, gold-plated mirrors, necklaces, sarcophagi, funerary masks and gold-plated furniture), illustrated with documents tracing their discovery, the exhibition also looks at the status of these works, which are one of the oldest and most universal forms of artistic expression.